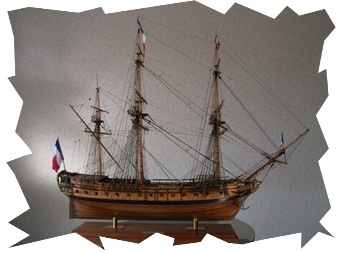 There were two Renommee’s built in France, one in the 17 Century and this one in the 18 Century. Launched in 1744 at either Byrone or Brest, La Renommee was a one-off 40-gun ship designed by Antoine Groignard with 30 12-pounders and 10 8-pounder guns. She was captured by the British Navy (HMS Dover) 27 September, 1747 and converted into a 30-gun fifth-rate frigate as the HMS Renown and served until she was broken up in 1771. However, this type of frigate is very important in the evolution of ships of the British Navy because it inspired the development of a series of fifth-rate frigates equipped with only thirty guns of large calibre, all placed on the second deck. The following photos are an example of how is the finished model..